JPEGmini was developed by ICVT, which is dedicated to optimizing media compression technologies. ICVT’s goal is to improve the user experience and reduce the costs associated with storing and transmitting media files. You can do it all alone, jusy open Photoshop or your program for jpeg, and dont save it with the quality 12… that’s all. Jpegmini does not reduce the quality of the photos. Pretty impressive too. Image reduced as much as we could without making a mess in photoshop at 248KB, reduced to 35KB. Mighty impressive. I just tested a jpg that was saved two ways. First using photoshop with a quality setting of 40 then the other using jpgeg mini. They looked the same but the image from jpegmini was half the size. So yes, it’s more than not saving your jpg at maximum. “Jpegmini does not reduce the quality of the photos.” – this is not true. This is a jpegmini processed file placed over the original jpeg with overlay mode “difference” (some levels adjusted for demonstration) – a lot of artifacts, because jpeg is REcompressed. Nice way to boost your audience by publishing false commentary. Perhaps you don’t know how to use Photoshop, but you can have the exact same result in it. 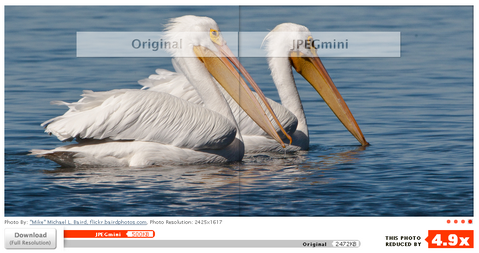 And yes jpegmini degrade the images, it’s obligated, you can’t reinvent jpeg, a jpeg is a jpeg. Did no one learn from GIF?